Japanese animation is a big industry and some of you may already know that there’s one name that has dominated this world for some time. Studio Ghibli. Many people that come to Japan, come with the sim of recreating the magic of these films and the worlds that come to life in each of them. While you might not find it on the streets of Tokyo, it is there, just a short way away is the one place you can definitely find it. The Ghibli Museum in Mitaka. 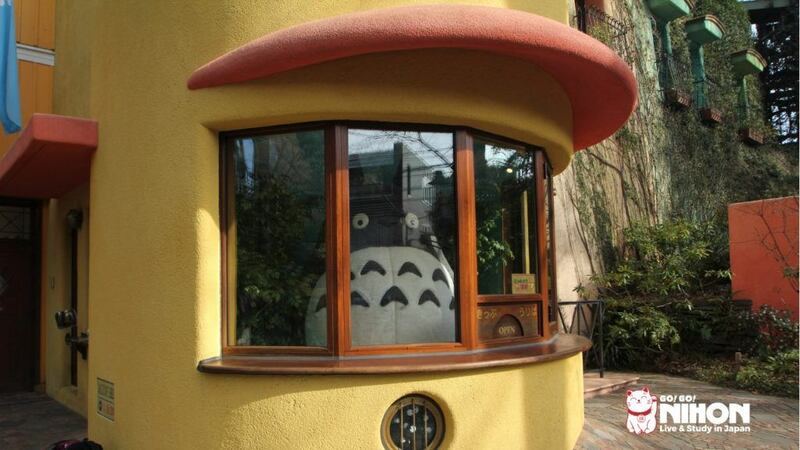 The Ghibli Museum is a museum like no other. It’s not just a normal building with exhibitions, it’s a recreation of some of the brilliant elements of the films. The building is purpose built and lets you get lost in your own Ghibli world. The excitement starts right from when you get off the train. There are a couple of ways to get to the museum from the Mitaka station. Firstly there’s a community bus from the south side of the station directly to the museum for just 320 yen return. While it’s not quite the cat bus it does get you there quickly and easily and is decorated in Ghibli characters. If you decide to walk, it’s about equal distance from both Mitaka and Kichijo-ji stations. Both routes are also quite straightforward. The route from Kichijo-ji cuts through a park making it a particularly lovely route in the spring and autumn. The route from Mitaka is well signed and easy to follow particularly given that the signage is Totoro themed! You’ll know you’ve arrived as you’ll be greeted by a giant Totoro at the entrance, make sure you say hello and get a photo with him before you head inside. It’s worth remembering that you can’t take photos inside the museum so you’ll want to spend a lot of time just looking a the building and getting your snaps. It’s colourful covered in plants and generally not your normal building, it’s everything you could hope for from a building made by Ghibli. The first delight once you’re inside is your ticket. Keep hold of this as each ticket gives you entry to a unique Ghibli short film that can’t be seen anywhere other than at the museum. They’re normally around 15 minutes long and don’t have subtitles but it’s still a joy and most are easy to follow even if you don’t speak Japanese (yet!). They tend to rotate the showings every couple of months as well so if you visit more than once in a year you’ll likely get a new treat each time. The ticket itself is special too. Each one is like a short film strip with three frames from a random Ghibli movie so you can compare with your friends and try and work out which film yours is from. If you’re not too distracted by the uniqueness of the building, you’ll want to start on the ground floor after you’ve seen the short film. There’s a room to the right when you first enter, that is covered in darkness. This is to let you make the most of each exhibit. The room is filled with different sections of animations using different techniques, whether it’s a projected film or a 3D zoetrope, it gives you a chance to see alternative techniques and science behind the different types of animation in a truly unique way. As you move through the museum you’ll want to stop off at some of the less standard areas that still offer a lot of delights. There’s the Straw Hat cafe with plenty of themed Ghibli treats. If you happened to be taking some kids with you, there’s the Catbus playroom that has a kid-sized Catbus that they can play in and around, it’s also surrounded by hundreds of soft, fluffy soot monsters. It’s often the cause of much jealousy for the adults. Then there’s the Mamma Aiuto shop. Styled like the shop from Porco Rosso, it’s difficult not to get carried away buying yourself a few treats. Then there’s the Tri Hawks reading room that plays on the name of Mitaka, while most books are in Japanese it can be a good way to practice your language skills. On the next level, you’re taken into Miyazaki’s own world. There are several rooms made up to look like an animation studio and his own personal space. For anyone who’s interested in drawing and animation themselves then this part will surely get your creative juices flowing. With sketches and paintings lining the walls and covering all surfaces. Paints, pencils, pens everywhere, it’s an artists dream and makes you feel like you’ve fallen into Miyazaki’s head as he comes up with his latest creation. There are even shelves of books filled with hundreds of storyboards. You could easily spend a few hours in these rooms alone. Then there are the specialist exhibitions. This will change every so often as well so be sure to check what’s on when you want to go. At the time of writing the space explored the world of Ghibli food. There were mocked up rooms showcasing what the different kitchens and restaurants would look like if made into a set. In true Japanese style, there was plastic food showing the famous meals from each film and storyboards and films showing the amazing skill that goes into making the dishes seem so realistic in each of the films. While it might be different when you visit, it shows just how much effort and intensity they bring to each exhibit. Once you’ve explored all corners of the museum, make sure you wander around outside, the surrounds are just as magical and there’s a very peaceful roof garden that has the giant robot soldier from Castle in the Sky standing alone in the centre. You’ll need to be prepared once you’ve decided to visit. Getting tickets can be a little tricky and you need to make sure you plan in advance as there are no tickets sold on the door at the museum. If you’re buying your ticket from outside of the country you will need to buy it from a JTB Group site or agent. The Ghibli website gives you links to these websites depending on where you’re from. Tickets for the following four months are available from the 1st of this 4 month period. So tickets for January through to April are made available on the 1st January. Alternatively, you can buy them through Lawsons. These are made available on the 10th of each month the following months’ tickets. So if you want to go in January, you need to buy your ticket on the 10th of December. If you’re in Japan then you should buy it at your local Lawson, there are over 12,500 across the country so it shouldn’t be too much trouble. These have the same release dates as if you buy from the Lawson website. So you’ve got your ticket, you know how to get there and you know the places to get lost in. What are you waiting for? !